PIM Certified Hybrid Transmitter Combiners Are Now Available From Excelwave Technologies. Hybrid transmitter combiners provide compact cost effective solution to enable multiple transmitters operating at different channel frequencies share one transmission antenna in a land mobile radio system. Excelwave Technologies designs and manufactures various type of hybrid transmitter combiners for different frequency ranges and different number of channels. 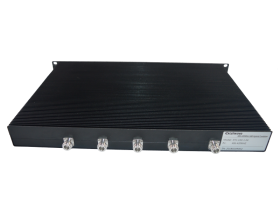 These products are optimized for minimum insertion loss, maximum channel to channel isolation and rack space efficiency. For UHF and above hybrid combiners, high isolation dual stage isolators with insertion loss ≤0.4dB and PIM≤-70dBc@2*43dBm are used along with hybrid couplers with PIM≤-140dBc@2*43dBm.